Walley’s Hot Springs, an elegant spa and luxury hotel, was built in 1862 by David and Harriet Wally at a cost of more than $100,000. Walley’s had a 40-room hotel with 11 bathrooms, a grand ballroom, a large stable a swimming pool, and several bathhouses with resident physician and masseur. Famed for its baths, the springs are said to cure everything from sore muscles to rheumatism. Walley’s also catered to the palate with “all substantial and every delicacy in season.” It was a regular stop on stage routes, and a daily stage met the V&T train in Minden. 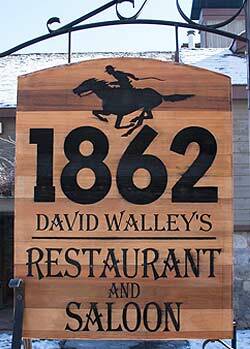 Adjacent to the Pony Express Route and the Emigrant Trail, Walley’s was frequented not only by those who wanted to wash away the dirt, hardship, and disappointment of the mines, but also those who needed to soothe away the cares and pressures of success. These visitors knew the rich velvet, leather and solid brass fixtures of private railroad coaches. Please click on the image to download FREE standard size (4X6 inch) high resolution (300 dpi), ready to print "Emerald Bay" post card. Print it on your desktop printer, or take file to your local printshop. If you need any Graphic Design Services, we are always happy to help!